BetBright £50 Free Bet for all new players: JOIN NOW!! BetBright continue to go from strength to strength. They offer great ongoing bonuses and cash back offers to keep your interest! 25% Back on your losses as a free bet which gives you a degree of insurance on your bets! BetBright is an Irish based bookmaker who’s focus has been on mobile and inventive offers. They have an award winning platform, great customer service and great weekly promotions! The are only promoting within the UK market at the moment but have plans to reach out to Europe. if it’s a casino offer that you are after, GET £600 WELCOME BONUS when you open an account today! Betbright doesn’t offer the widest range of markets, but it does offer the essentials. They mainly concentrate on products, they have different promotions that other bookmakers do not have. If you’re looking for an online bookmaker that boosts your acca or gives you an extra leg for free then BetBright is for you. The main betting markets that BetBright focus on is football and horse racing. The offer best odds guaranteed which is what all horse racing punters look for when selecting a bookie. BetBright have started to promote more of the American markets and sports. The UK punters are gradually understanding the games and the betting possibility of the US markets and the BetBright is an online bookmaker looking to make the most of it. Along with the increase in American sports markets, they has a full range of virtual sports betting markets. The odds on the virtual markets are not amazing, but they do offer online promotions. You can bet on a full range of virtual games from football, tennis and track events. BetBright offer all new customers a £50 Free Bet. In terms of free bets online, this is very attractive for customers who are new to BetBright. The minimum amount that you can deposit is £10 and that has to be placed on odds of 1.66 or more to qualify for the free bet. BetBright will then automatically credit you with a free bet of 50% of your stake. Please be aware that they will only credit you with the free bet if your first bet loses. Our betting advice would be to place your initial bet on a bet of between 3/1 to 5/1, if it wins then happy days! If not, you get your free bet to be placed on more sensible odds of evens. This is for new customers only, T&C’s apply, over 18’s only, please gamble responsibly and within your means. BetBright offer a great range of promotions. Their head of CRM Mark Harkin really has the team buzzing. He and Danny ‘the unit’ Carey offer regular promotions and free bets to keep you engaged in the brand and playing with them. The ACCA+1 offer is a great offer for those who bet on football. They will give you an extra leg to your acca for free! We have reviewed the promotion along with others on our news section. One for the horse racing punters is ‘head or less’. If your horse loses by a head or less they will refund you. They also offer the standard best odds guaranteed check out the bestonlinefreebets.co.uk page which breaks down all the betting jargon for info about what this and other terms mean. In-play betting what BetBright thrive on. Check out our ‘betting on in-play’ article. Most of the in-play betting is done on a mobile device which is an area that they really do excel. Their mobile site and betting app operate at a high level compared to BetBright’s counterparts. 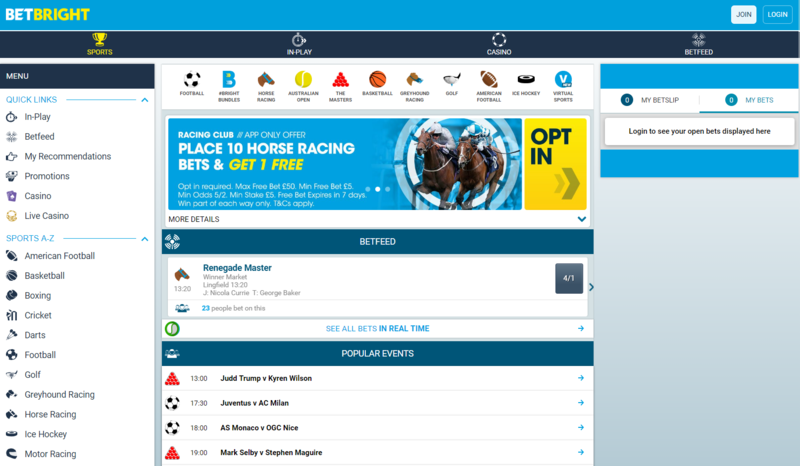 Mobile first is BetBright’s way of thinking. And this doesn’t change when it comes to its offers of in-play markets. There are literally hundreds of betting markets for you to bet on with them. There is no, live betting tab which is a little frustrating, but after playing with the site and placing a few online bets you get the hang of it. As we suggest with every online bookmaker, have little play, press the right buttons, pull the right leavers and see how it feels for you. BetBright offer live streaming with BBTV for horse racing and football. They have also recently introduced cash out, a feature which is now a basic for all of the top online bookmakers. The streaming service brings the action direct to your desktop or mobile device. Unfortunately they only accepts UK GBP and only a handful of payment methods comparison to other online bookmakers. All the information can be found in your online account or speak to one of their many customer service agents. CHECK OUT BETBRIGHT AND PLAY NOW!